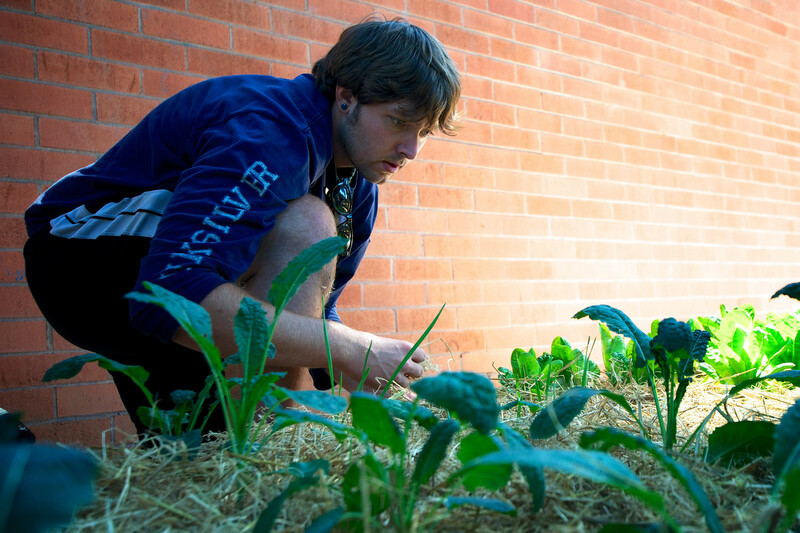 In a neon orange beanie and customized duct tape shoes, Eco Students President Tyler Wescott tenderly tucks lettuce into the earth of its new home with a blanket of straw to help keep the moisture in. Wescott leads the effort to rebuild and replant the community garden hidden behind a wall of bushes near Mary Park Hall and Font Boulevard for future Gators. The garden established in 2008 was soon forgotten when the founding group failed to pass on its work for returning students to maintain. 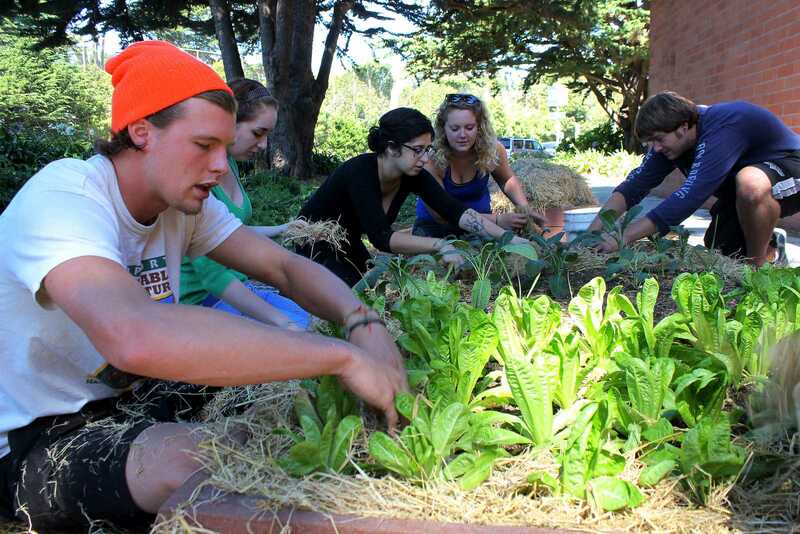 The club, which is an offshoot of the environmental studies department, said they won’t let this happen again and they plan on reaching out to new students as a way to help guarantee the garden’s future at SF State. Michael Todd works on the community garden behind Mary Park Hall Sunday Sept. 15. Photo by Kate O’Neal / Xpress. Students are using the garden to grow a variety of plants including kale, romaine lettuce, spinach, snap peas and violas, but there are plans to extend the variety. “The main goals are education, awareness and community building,” said Wescott. To educate the community about local gardening they plan to place signs on each of the planters showing pictures of the fully grown plants along with a description. They also want to host community seminars on how to plant a garden at home and how to maintain a garden like the one on campus. For most people living in an urban environment, home-scale gardening is difficult to do, according to junior Michael Todd, a newcomer to Eco Students. That’s exactly why Eco Students was formed, according to Wescott. The group wants to give people a place to grow their own food. It’s not just the students who are helping to make the garden work. Chartwells, the dining service at SF State, plans to promote the garden by posting information on their website about it for students. They also support Wescott’s idea of hosting a catering event where Chartwells will use vegetables provided by the Eco Students’ garden. Eco Students has applied for ASI funding and are now waiting for the response, but in the meantime they’ve turned to Scrap, San Francisco-based nonprofit arts and crafts organization which has everything needed to build the garden at little or even no cost. Founded during the 1970s, Scrap now serves more than 30,000 nonprofit groups. They receive nearly a ton of material every day, meaning there will be no shortage of supplies for Eco Students to use. Even though Eco Students have a faculty advisor, they are run entirely by students. Anyone can get involved in Eco Students or the garden by contacting them at sfsuecostudents@gmail.com.